Since I'm not writing anything new at the moment, and reading a blog about the tediousness and momentary bursts of excitement of the editing process every day would make me want to claw my eyes out, I figured I'd write something a little different. So here's something a little more personal: my Sense (or lack thereof) of Style. This won't be about how I decorate my house, which is basically Ikea with clutter. For example, the legal pad with my notes for the third novel in this series has been sitting on the floor next to the coffee table, balanced on a marker, for five days. No one's touched it. This is sad. 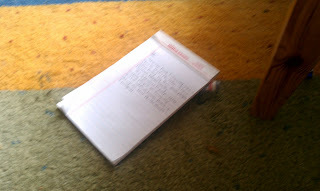 My housekeeping is so bad, this hasn't moved in five days, despite being in the freaking center of the living room floor. No, this will be about how I decorate myself. When I'm at home, or even if I only have to run to a friend's house or drive the kid to school, 99 times out of 100, I'm wearing pajamas (Sock Monkeys! ), ratty t-shirts (today it's from a 1996 Metallica concert), my bathrobe, or a hoodie (Lets go Caps!). Oh, and slippers. I have maybe ten pairs of slippers, and I wear them all during the winter. It's almost the end of slipper season, though, and that makes me kind of sad. Slippers are cozy. If I'm running errands, I have one of two looks to choose from. I either look like someone who's escaped from the military and discovered the art of sloppy dressing, or I look like Mary Poppins. Definitely polar opposite looks. Let's start with prim and proper, though, shall we? I love Victorian Goth and Steampunk clothing. I adore long, ruffly skirts, corsets, parasols, and funky little hats. My daughter's friends call me the "Goth Mom" and they eagerly await my next outfit and tiny hat. Granted, this look takes a bit more work to achieve, given the corsetry, makeup, hair, and overall presentation. And it's incredibly impractical during the summer months. Thus, my other look. I have a bizarre compulsion to shop at Army/Navy stores. I wear a lot of black/olive drab/camouflage. It suits the main character of the series I'm writing, so maybe I've taken on a little of her personality? She's a soldier, so maybe I've become a little more like her? Or maybe she just brought out those parts of my personality? I love stompy army boots, and the comfortable fabrics and cuts of military clothing. BDU's were designed to be rugged, breathable, and flexible. Beats the hell out of skinny jeans. These two looks seems to fit the two halves of my personality, too. I love to be a proper lady, to show good manners. The whole Victorian thing takes care of that. But I also love hiking, kayaking, and all outdoorsy-type activities. I teach girl scouts how to navigate in the woods with a compass, how to pitch tents, and how to build fires. The whole pseudo-military look takes care of that. My favorite thing about my split-personality sense of style is going to a store where I'm a regular customer, and seeing the surprised looks on the employees faces as they recognize me in my other identity. I'm convinced a few of them think I'm actually a set of twins. Either way, I'd never be able to settle on a single personal style. Frankly, I don't care. I just know that whatever mood I'm in every day, I'll be able to dress the part. Lately, though, I've been more military than Victorian. Thank you, Thalia (my main character), for bringing that to the forefront. I was a little sick of doing the makeup thing every morning. One last thing: HAPPY VERNAL EQUINOX!!! 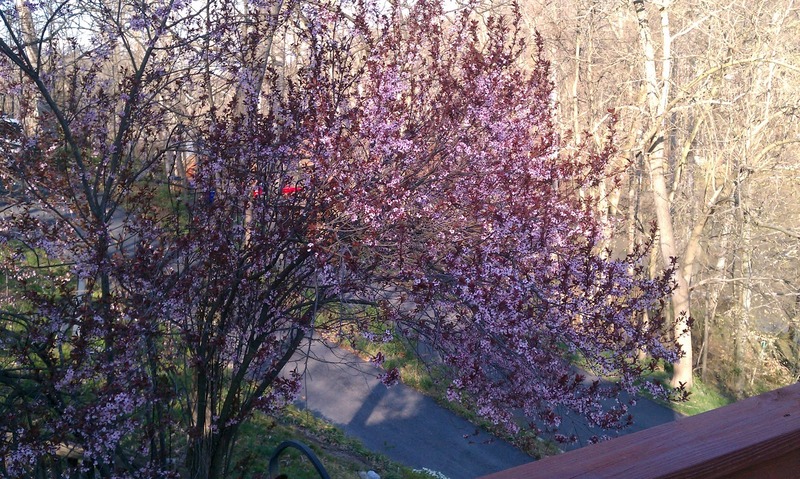 I just realized I almost missed my plum tree in bloom. 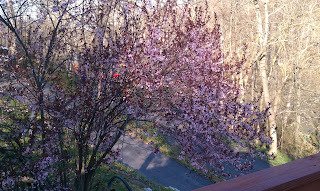 All the blossoms are crazy early this year, and I did miss the peak bloom, but here's a pretty picture, nonetheless.